Erica Bunker | DIY Style! 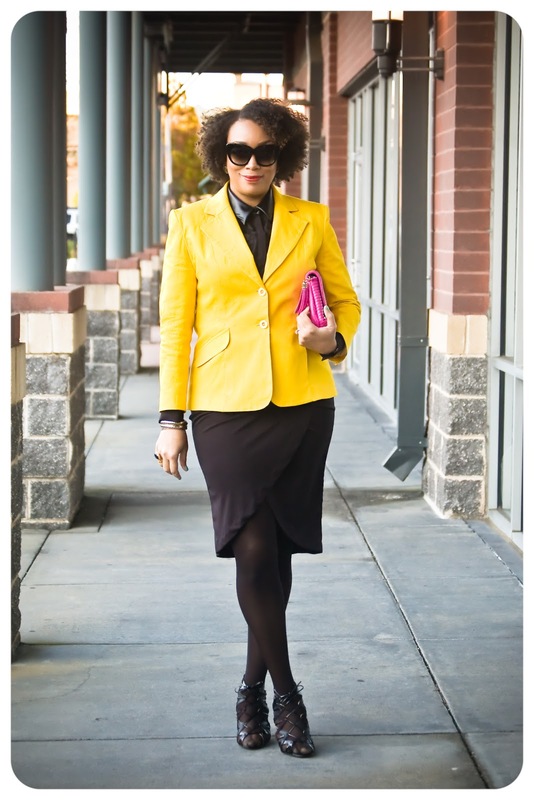 The Art of Cultivating a Stylish Wardrobe: Review: Simplicity 2446 | Bring on the Brights! Readying myself for Spring! Pantone calls this color, this year -- Lemon Zest! 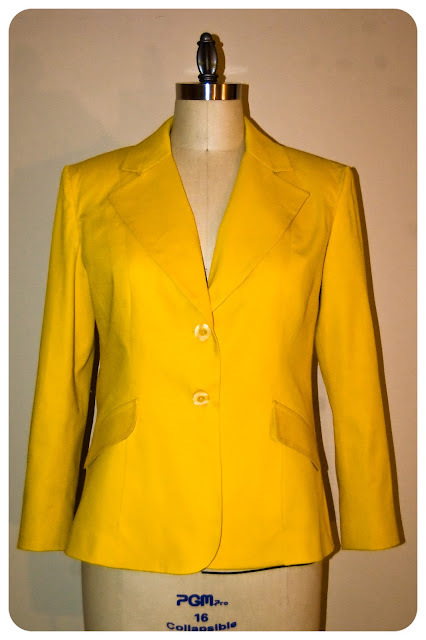 All of last spring and summer, I wanted this yellow blazer. I even cut it out. But somehow I became distracted and this project fell by the wayside. But nevertheless, I rediscovered it bagged away and decided it was the perfect time to revisit it. Well, this is Simplicity 2446. This is an Amazing Fit pattern from Simplicity, so it's chocked full of great tips for the novice jacket sewer. I have my own point of references I use. The pattern was drafted in a great way. I could truly see this one as becoming my tried-and-true blazer pattern. Since this pattern offers cup sizes, there was no need for the dreaded FBA. So I cut the C cup and kept it moving. This is the so-called longer version of what was offered, so I decided not to lengthen and to see if I liked it. Since this pattern is drafted with 1" seam allowances in all of the important places, I just nipped/tucked and tweaked as needed. This was my first time sewing this pattern and I truly detest making a muslin, so this became my "test garment". Maybe I'm weird, but muslins just don't do it for me. I have to have a fully completed garment to tell what adjustments need to be made. With a muslin, I can't tell if the pockets will lay flat or how the jacket will actually wear, especially after the lining has been inserted. If it's a pattern I really like, I don't mind making it all over again. Like a plan on doing with this one. The fabric is a 100% cotton twill from my stash. I can't remember where it was purchased... I should really label the fabric before I fold it away. The lining is Bemberg from Joanns and so are the buttons. 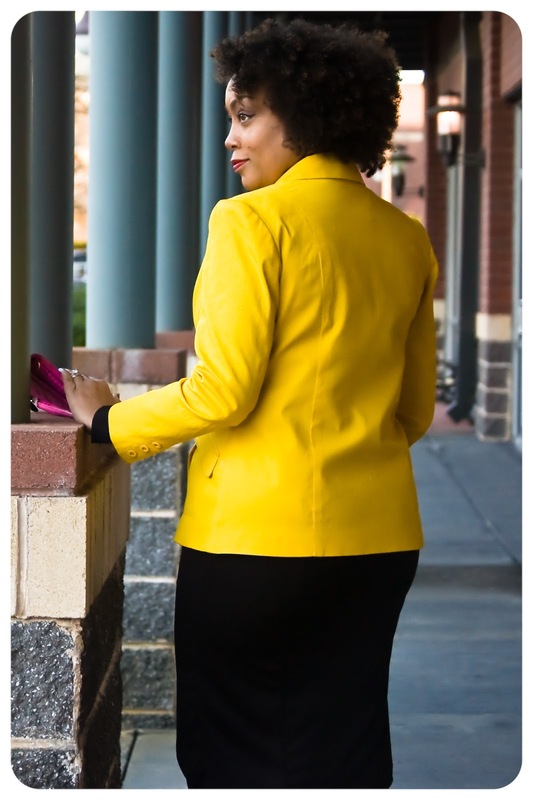 I love a jacket pattern with a 2-piece vented sleeve. Here is the faux pocket flap and the inseam pocket. 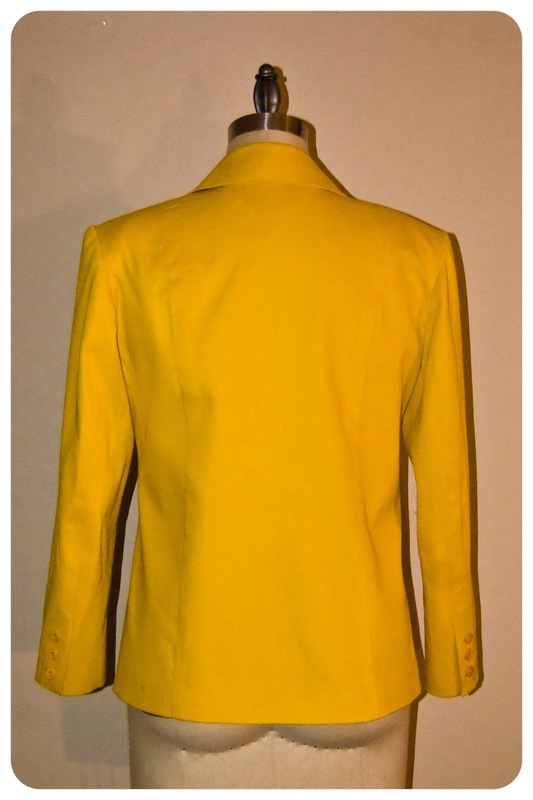 I lengthened the body of the jacket by 1 inch. I decided to omit the inseam unusable pockets. I plan on trying to refine the fit of the back of the jacket, by tapering a little more at the waist. And I'm going to decide if I really like this two-button style or if I should modify it to a single-button closure. And also, I'm going to add a fourth button to the sleeve vent. I have long arms so there's plenty of room. So there's no question of will I make this again. The real question is how many will I make. I have another jacket pattern cut out, that has more advanced details (i.e. welt pockets) that I'll tackle after this next one. But who knows, maybe I'll end up combining the two and creating my own pattern. Wearing with my jacket: Similar jacket HERE and HERE; blouse: Prabal Gurung for Target; skirt: Vogue 8711; tights: Spanx; shoes: Prabal Gurung for Target; clutch: old, similar HERE and HERE. I really like this pattern and will definitely check it out. The colour looks fabulous on you! Totally agree with your opinion on muslins - such a drag! I have to make the garment up in the correct fabric before I can see what changes I need to make. Miss Jackson, that's the only way I can tell what's needed. This is fab, Erica. Love the colour and style - looks great on you. I'll definitely be looking at this pattern. Thanks for posting! I think it's definitely one to own. Thanks Rachel! This colour is fantastic! What a great way to head into spring. I'm interested about this pattern as well- the fit on you looks fab! This looks so pretty on you. The color is great and thanks for the tips on this Simplicity pattern. 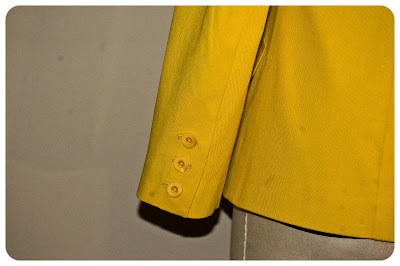 Sometimes I have to make a conscious decision to not sew yellow! LOL. Thanks Cidell! Oh Erica, my heart is skipping some beats! This looks awesome on you! I am currently making a pastel yellow jacket, but now I suddenly need a bright one too! Thanks Amanda and good luck with your jacket! Yellow is probably my favorite color. I'm going to wear it out. Thanks Schmoomom. The jacket looks so great. My "test" garments never look this good. That yellow looks fabulous on you. Yellow is one of my favorite colors - but unfortunately not a color I can wear. Ohhh I am so jealous. Do you have a suggested resource for setting in sleeves? I have a shirt nearly completed...Sleeve #1 went in ok, sleeve #2 is not playing nice. I've made all my button holes, done princess seams, added cuffs...all proud moments and then this SLEEVE! lol! Mrs. Smith, there's no magical method for setting sleeves. The more you do it, the more comfortable you'll become with doing it. This is not to say that they'll be perfect every time. You remove the pucker and keep going. Thanks! The jacket looks great! I hate making a muslin as well because it never seems to help. I'm making my first jacket and I made a muslin, made adjustments and decided to cut a bigger size. Now it is too big and I spent so much time on it that it is discouraging. Maybe I will try this pattern with the fitting tips and cup sizes! I was gonna tell you how much I liked the jacket and then got stuck reading the comment/answer above. Great answer Erica and great outfit! So cute, black and yellow is beautiful together. Beautiful jacket, Erica. I love your colorful wardrobe! Gorgeous jacket--you really rock the blazers!! I couldn't agree more about muslins--don't like making them, and I really need to wear a garment for a few hours before I recognize it's true fit. Lovely as always! Your hair is just sprouting lovely isn't it??!!! This is one fine lookin' test garment, Erica. It looks terrific on you! As always, another outstanding look. I just love your taste, and you always look so fashionable. Love the jacket. Oh, that out loud sunshiny color is just what we need to see to break up this cold weather! What a great looking jacket. Love the slanted pocket flaps. Love the test jacket! You will certainly get some good use out of it. I had my eye on this and was considering it because of the cup sizes. I need a TNT jacket for work and this one looks like a good one. I just wanted to see a review first and I respect your talent. With that said Thank you. I'll give it a whirl. Thanks Carol, good luck with your version! Gorgeous color! I just wore a yellow dress the other day in a sea of all black lol. This jacket looks great! I need a yellow blazer in my closet! Oh my gosh, that jacket is amazing and looks so good on you! You amaze me with your talent! Thanks Allison for the reminder. I'll get that to you. 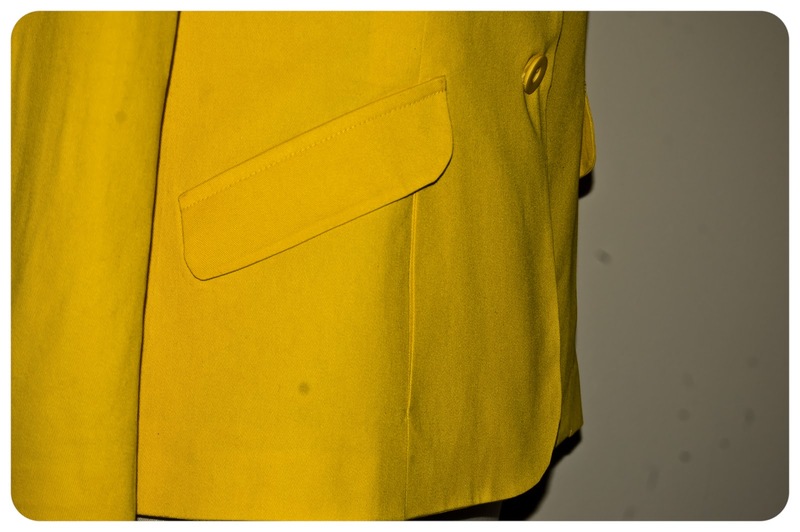 Wow, you did an amazing job on this jacket, it's sensational and the yellow looks so good on you. Bring on the spring colors ! I love the jacket. I'm glad you mentioned the cup sizes. It would be nice to skip the FBA ,for a change. Yes, it was great to have one less alteration to worry about. Looking good Erica and the shoes are hot! This is gorgeous! Love the color! Hi Erica, I love the jacket you always do a fantastic job. I am wandering since you used this as a muslin did you use interfacing as the pattern called for. I said I HATE muslins and I used this as “test garment”. So I did everything I was supposed to do and wore this jacket to shreds! Thanks! Thank you...Sorry that's what I meant test garment...Awesome I'm working on a test garment myself.